NY Pump & Motor has been providing Industrial Pump Service in NYC Metropolitan area since 1941. We pride our self with prompt & professional Industrial Pump Services along with high level of customer care. It seems unusual in our industry to consider all the aspects of a system working together, even though this is what we are aiming for. The aim of this white paper is to promote ‘Joined-up Thinking’. Water is a strange entity, the only substance that gets bigger (expands) as it gets hotter and as it gets colder when viewed from a 4°C starting point. Water is not compressible, for practical purposes, and as a result, the ‘pressure’ that we see in water systems comes from the physical weight of water and the associated equipment for moving it around. The physics of Static Height are easily simplified in our industry, for practical purposes 10m of vertical height on a water system relates to a 1 bar pressure at the bottom, to have 0 bar at the top. We can think in terms of the sea, easy to swim and float on the top, difficult to exist on the bottom of the sea with lots of water above. In terms of physical engineering, a submarine to go 10m underwater in a swimming pool is the same submarine that can go 10m underwater in the Atlantic. The weight of water is the key to understanding here, it does not matter if a pipe is a 15mm diameter, 1000mm diameter or 10,000mm diameter, for a 10m system height, 1 bar is the water pressure (weight) at the bottom with no pressure (weight) at the top. A circulation pump is designed to do one thing, move water around a system at the required flow rate. To do this it has to effectively push, and sometimes pull, the water. Back to Physics again, push and pull are simply forces, that affect the perceived pressure of the water at that point. This is also referred to as ‘pump head’. ‘Pump Head’ is what is required to push the water around a system, not to overcome the static height, it is there to overcome the frictional resistance of the system in terms of pressure loss through heat exchangers, pipework, fittings, emitters, and valves. This way, a system with a 200-meter static height does not need a ‘Pump Head’ of 20 bars. For modern pumps to work effectively, a suitable positive pressure is required on the suction side of the pump. 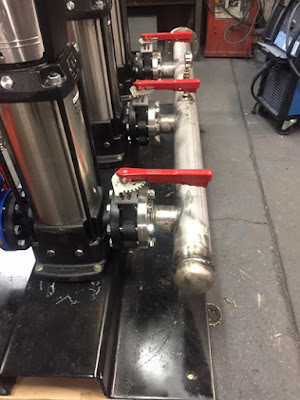 This is called the net positive suction head (NPSH) and is generally not a consideration when the pump equipment is sited at the bottom of a tall system, with the pump seeing the whole static head of the system. However, following our overall approach of joined up thinking, the circulating pump cost may be significantly reduced if it is moved to the top of the system. In doing so it must also be considered that a slight increase in fill pressure is required at this point to make sure that the NPSH requirements of the pump are also met.